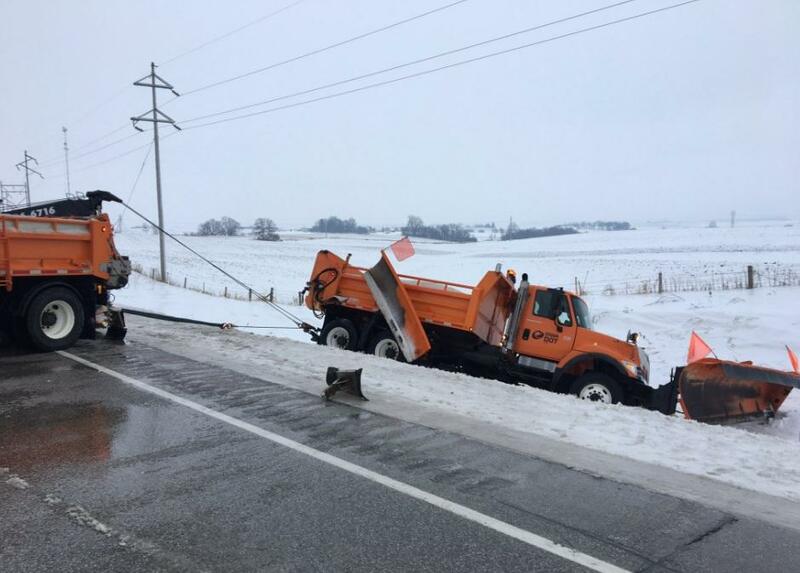 An IDOT truck slid off U.S 18 in northeast Iowa this morning. Iowa seems to have avoided the worst effects of an ice storm that began Sunday evening and still lingers this afternoon, left 1/3 of an inch of ice on parts of Iowa, and sent hundreds of crews onto roads and highways to remove the ice. As of this afternoon, most of the state’s major roadways were listed in good or “seasonal” condition, or only partly ice or slush-covered. Bargfrede says this morning, there were about 475 IDOT trucks on the state’s roads. He says the only serious trouble spot this morning was far northeast Iowa, where roads were especially icy, but conditions were greatly improved by midday. The storm did not significantly affect electricity service in the state. About 3,000 MidAmerican Energy customers in Des Moines lost power for about an hour this morning, but the utility says that outage was caused by an equipment problem near Drake University, and not related to the ice storm. Ice buildup at IPR's Des Moines studios this morning. An ice storm warning remains in effect until midnight for all but far northern and roughly the eastern quarter of Iowa. Light rain continues, though for much of the state, the worst appears to be over. Some additional ice could accumulate later tonight as light, intermittent rain continues. Small says by Wednesday, temperatures in much of Iowa will be in the 40s, and could be close to 50 later this week.